"De Oppresso Liber," is Latin for "to free the oppressed." 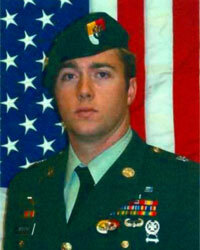 According to his battalion commander, Sergeant First Class Justin S. Monschke, 28, well deserved the prestigious Green Beret he earned in 2002. Lieutenant Colonel Heinz Dinter told hundreds of mourners who attended Justin's funeral at the First Baptist Church in Denton, Texas, "On October 14, Sergeant First Class Justin Monschke gave his life so that one day the Iraqi people can sound the blessed refrain of freedom." on October 23, 2007, with full military honors, including a 21-gun salute, SFC Monschke's remains were laid to rest in Jackson Cemetery just south of Krum. The Army presented American flags to Monschke's wife, mother and father while a bagpiper played "Amazing Grace." Hundreds of family, friends, veterans, active-duty soldiers, police officers, firefighters and community members surrounded them during the commitment ceremony. Justin's father, Larry Monschke of Fort Worth, said his son enlisted in the Army in 1996 during his junior year of high school. "He had to graduate high school first, but he wanted to go right away. So, as soon as he graduated, he left for boot camp a week later." He loved being in the Army, and he served his country with pride, his father said. SFC Monschke was serving in the south Baghdad region of Arab Jabour, Iraq, as a Special Forces Operational Detachment-Alpha team weapons sergeant assigned to Company B, 2nd Battalion, 3rd Special Forces Group (Airborne) from Fort Bragg, North Carolina. He died there when an lED exploded near him while he conducted a dismounted movement to a suspected enemy position. During his ten years in the Army, SFC Monschke trained extensively in advanced military tactics, paratrooper operations, and emergency medical treatment while attending Ranger, Special Forces and noncommissioned officer training. He served as an instructor at the 5th Ranger Training Battalion in Dahlonega, Georgia and as a squad leader and observer/controller at the Joint Readiness Training Center at Fort Polk, Louisiana. He deployed in Operation Iraqi Freedom in July 2007 as a member of the Combined Joint Special Operations Task Force. This was his second deployment in the military and his first in Iraq. Besides his father and mother, Patty Jett of Denton, SFC Monschke is survived by his wife, Melissa, a daughter and son, Ashley and Ryan, and a stepson, Dylan, of Lillington, N.C. Sergeant First Class Monschke was recommended for the Silver Star and the Purple Heart, in addition to those already earned during his career: The Army Commendation Medal with one Oak Leaf Cluster, the Army Achievement Medal with two Oak Leaf Clusters, three Army Good Conduct Medals, National Defense Service Medal, Armed Forces Expeditionary Medal, Afghanistan Campaign Me~ Iraqi Campaign Medal, Global War on Terrorism Service Medal, Non-Commissioned Officer Professional Development Ribbon with Numeral 3, Army Service Ribbon, Combat Infantry Badge, Expert Infantry Badge, Parachutist Badge, Military Freefall Badge, Air Assault Badge, Special Forces Tab, and the Ranger Tab.